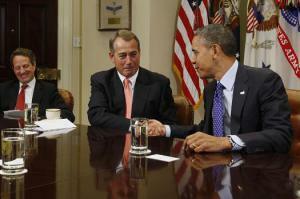 Boehner And Obama Are In Agreement | Stop Obama Now!! Sometimes they shake underneath the table, too. It just seems that Boehner and Obama have made an under-the-table agreement to pass amnesty by Obama’s diktat. Sure Boehner complains somewhat bitterly and gives the Constitution lip service, but he is not taking effective steps to stop Obama. Watch what he does, not what he says. Boehner’s lawsuits are just a waste of time and money, designed to kick the ball down the road until people forget and it is too late to do anything about Obama’s usurpation.